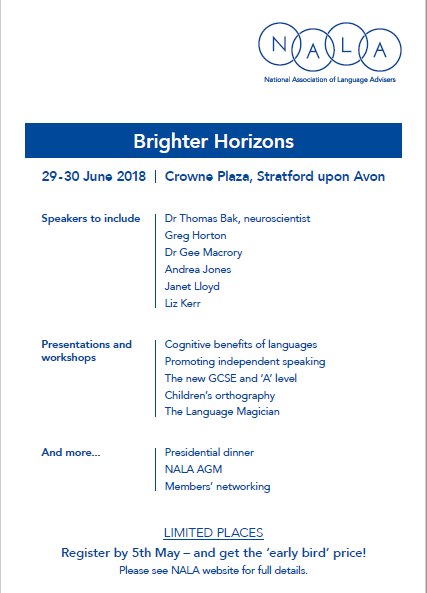 The programme for this year’s conference ‘Brighter Horizons’ has been released and it looks like it’s going to be a good ‘un! You can find all the information at this link, and don’t forget that discounted rates are available for those booking their place by 5th May. As in recent years, the conference is open to non-members too. Alan Dobson attended the Language Liaison Group (LLG) on behalf of NALA in June. You can read his report here. The terms of office will be two years until the end of July 2018. Information on the responsibilities of each post can be found on this page.